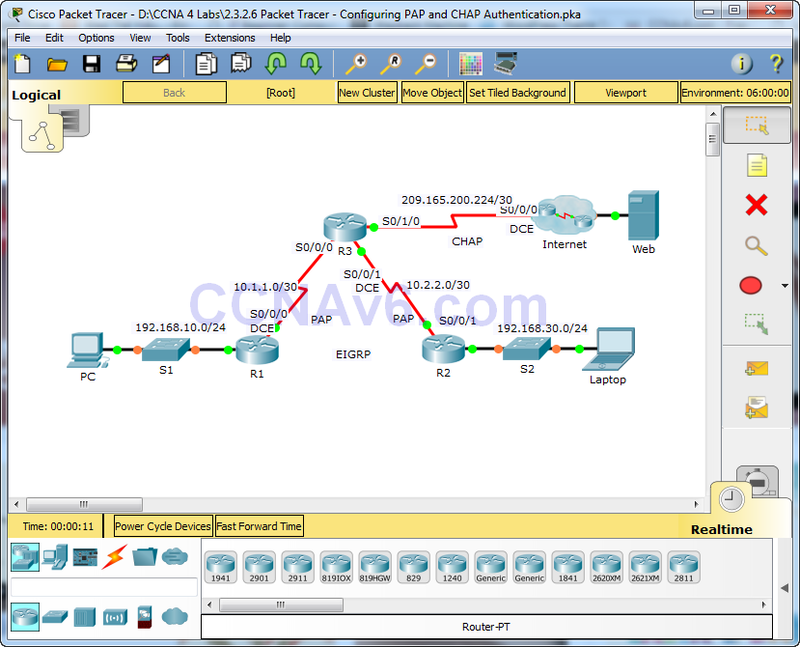 In this activity, you will practice configuring PPP encapsulation on serial links. You will also configure PPP PAP authentication and PPP CHAP authentication. Step 1: View running configurations on all routers. While reviewing the router configurations, note the use of both static and dynamic routes in the topology. Step 2: Test connectivity between computers and the web server. From PC and Laptop, ping the web server at 209.165.200.2. Both ping commands should be successful. Remember to give enough time for STP and EIGRP to converge. Step 1: Configure R1 to use PPP encapsulation with R3. Step 2: Configure R2 to use PPP encapsulation with R3. Step 3: Configure R3 to use PPP encapsulation with R1, R2, and ISP. Step 4: Configure ISP to use PPP encapsulation with R3. b. Exit the Internet cloud by clicking Back in the upper left corner or by pressing Alt+left arrow. Step 5: Test connectivity to the web server. 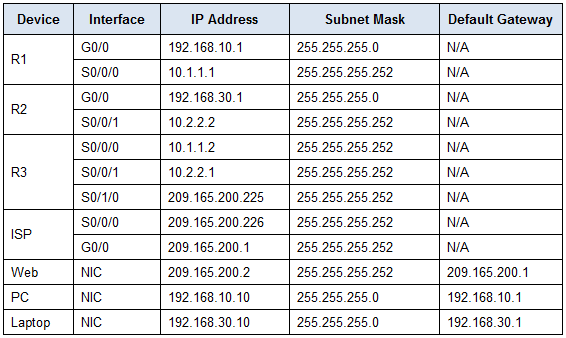 PC and Laptop should be able to ping the web server at 209.165.200.2. This may take some time as interfaces start working again and EIGRP reconverges. Step 1: Configure PPP PAP Authentication Between R1 and R3. Note: Instead of using the keyword password as shown in the curriculum, you will use the keyword secret to provide a better encryption of the password. Step 2: Configure PPP PAP Authentication Between R2 and R3. Repeat step 1 to configure authentication between R2 and R3 changing the usernames as needed. Note that each password sent on each serial port matches the password expected by the opposite router. Step 3: Configure PPP CHAP Authentication Between R3 and ISP. Step 4: Test connectivity between computers and the web server.